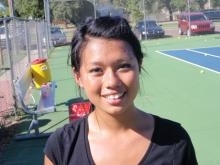 Susan Nguyen is the unanimous Western Athletic Conference Player of the Year as she dominated opponents winning 32 out of 34 total games to take top honors in #1 Singles at the WAC Girls Tennis Tournament in Great Bend. Liberal finished 4th Place as a team with 5 points edging out Garden City with 2 points. Top team honors went to Dodge City with 15 points followed by Great Bend with 10 points and Hays with 8 points. Susan Nguyen went 4-0, Kathy Nguyen went 1-3, Lauren Harp and Desirae Courkamp went 0-4, Kassandra Rosales and Katie Plunk went 0-4, and Jacqueline Nguyen went 0-4. The Lady Redskins travel to McPherson Friday night for Regionals starting 9:00 A.M. Saturday morning.